Dancefloor, s.r.o., Audica Professional’s distributor for the Czech Republic, has supplied a MICROseries system for the ’luxus bistro’, Bistro Cook & Look. 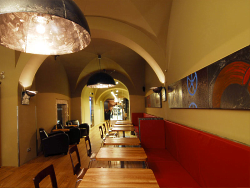 Bistro Cook & Look is located in the centre of the historic city of Hradec Králové, 100km east of the capital, Prague. The system consists of four MICROpoint loudspeakers in black, powered by a MICROzone amplifier/controller. Two MICROsub active subwoofers provide extended bass for the hi-fi quality system the venue wanted, to create a quality ambiance. In addition to audio quality, the MICROseries was chosen to compliment the clean, modern decor of the venue.